Using a good concealer is a necessity when it comes to the present lifestyle that most of us have. If your days are quite busy and you find yourself stressed more than every now and then, you might notice that such a hectic schedule also has an effect on your skin. Which is why around your eyes you will discover signs of this type of stress such as dark circles. As common as these dark circles are, they are never an aesthetic thing to look forward to. But the good news is that you can keep such reactions under control by using the right concealer. How to choose the right concealer for your skin, especially if your skin is dry, can be quite challenging. But by following this guide, you will find the answers to all your questions and you will make the best decision for your needs! Satin, matte or shiny finish? Investing in a high quality concealer can be tricky if you are not sure what to look for when you are buying such a product. Very little industries are so diverse like the beauty industry, which is why you will find a variety of concealers and while all of them might seem attractive, they are not all good for your type of skin. Especially if you have dry and sensitive skin. So, here is what you need to keep in mind when shopping for the best concealer for dry skin! You might be surprised to know that you can find liquid concealer, cream concealer and stick concealer and they can all be just as good as long as you are aware of the main differences between them. The liquid concealer is perfect for oily skin and normal skin while it can also be used successfully for skin with certain levels of acne because it will not clog pores. The creamy concealer is what you want to keep an eye on if you have dry skin because it can hydrate your skin very well while offering a great coverage for dark circles. The stick concealer is a perfect choice for sensitive skin and it can come in a satin or matte finish according to your preferences. This is also a very important aspect to consider because the right shade can really do miracles when it is used correctly. As a general rule, it is a good idea to choose your concealer a shade lighter than your regular foundation that way it will blend in with the tone of your skin a lot better considering that the dark circles are darker than your skin tone. But if you need to cover acne, you can try two types of concealers: one of a greenish color which is great for covering pimples and one of a more natural color to make your skin tone look more even. The answer to this question can be very subjective. But chances are that you will need all of these types simply because it matters tha type of foundation and makeup that you are going for. If your foundation is of a matte finish, so should be your concealer. Otherwise, the difference between your foundation and concealer will be too obvious and it will not create the effect that you need. Be careful with choosing a shiny concealer as it might not work as good if you have oily skin, however, it can work great for dry skin or sensitive one. Since concealers are one of the essential makeup products, you will see that there is a wide variety of them on the market. And choosing the one that is best for you might not come o natural. However, if you have dry or sensitive skin, you can choose any product from the following list without taking the risk of not suiting your needs. These products are recognized to be the best ones for dry skin and the most popular ones as well so you can definitely rely on them! Josie Maran is a high quality concealer that contains Argan oil. It comes in the shape of a crayon which makes it very easy to use and very comfortable at the same time. This concealer is creamy and it will get absorbed fast into your skin which is why it is also so effective. If you have a dry skin, this is a very good product for you and it can be used to cover dark circles but also blemishes and uneven pigmentation. As you wear this concealer, you will not have to worry about caking or creasing as it stays in place for hours after you apply it on your clean skin. The tip of this concealer is soft and it resemblances the consistency of butter which makes it very easy to apply. You can choose between six different shades so you end up with just the right concealer for your skin tone. Another great choice when you are looking for the right concealer for your dry skin is this product from NARS Radiant. It is very creamy and easy to apply and it blends in with many other makeup products as well. It is also used to hide not only dark circle but also those unpleasant signs of aging that might seem inevitable as time goes by. You can use it to successfully hide certain skin imperfections as well, such as acne or blemishes. And your eyes will look rested and healthy as soon as you apply it which can make a great difference for your daily makeup. Customers have mostly words of praise when it comes to this concealer and it is very suitable for women who also have a dry skin condition thanks to its creamy texture that moisturises the skin as well. Laura Mercier Secret Concealer is a very popular product among women with dry skin that need to cover their dark circles. One of the features that make this product so suitable for dry skin is the high level of moisture that nourishes the skin every time it is applied. It is recommended for sensitive skin as well because it doesn’t generate side effects and it is safe enough to be used on a regular basis without taking any risks. It is created to meet exactly the needs that your eye skin has and the level of moisture that needs to be provided. Besides dark circles, you can use this product to cover uneven pigmentation. If we also add the nutrients that are found in this creamy concealer, you end up with a high quality product that can satisfy all your needs at a very budget friendly price. If you are looking for a vegan concealer that is also highly efficient when it comes to covering dark circles, this Clove Hallow Concealer and Correct is the product for you. This concealer is not only known for covering the circles under your eyes but also other types of skin imperfections, plus it evens your complexion in a beautiful way that makes it look almost flawless after the first time you use it. Since this concealer was created in the United States and its author is a makeup artist, you can always count on its efficiency. It has no tals or parabens and no artificial fragrances so it is safe to be used even by women with sensitive skin. It will stay nicely on your skin and enough quantity of this concealer will be absorb so you get that look that you always wanted to have on your face. All you need to do is apply this concealer and forget you are wearing it as it will stay in place for the rest of the day. bareMinerals is one of those concealers that can do miracles for dry skin. And the good news is that you can find it in a variety of shades so you don’t have to worry about not finding exactly what your skin needs. It comes in light shades for those who have a more pale skin but also in darker shades to accommodate the rest of the potential customers. You can use it to successfully cover the dark circles from under your eyes but also different blemishes and even certain mild levels of acne. This will definitely become part of your daily makeup routine and it is safe to use for all types of skin, even the sensitive and dry one. To protect your skin as well, this concealer also has an SPF 20 coverage potential which is why you can rely on it at all times and even skip sunscreens as long as you don’t go into a severe level of radiations. You can try out the Bobbi Brown Concealer if you happen to have dry skin and dark circles under your eyes. And chances are that you will be impressed with the results which will appear quite fast. You will look fresh and with no signs of dark circles from the first time you apply this product. And you don’t have to worry about reapplying it as it is created to stay in place for the entire day. Since it is perfect for dry skin, this concealer also comes with a creamy texture and a high level of moisturiser that will nourish your skin in great depth every time you wear it. You need to pay attention to the shade you get this concealer in because it should be an idea lighter than your regular foundation, and you are lucky because you can find it in a variety of shades. NYX Professional concealer is made to accommodate all your skin’s needs, especially if you have dry skin and notice dark circles under your eyes often enough. It has a fast effect when it comes to reducing these conditions and it is very efficient for man hours during the day so you will not have to be concerned about reapplying it. You will be impressed at how many options you have when you choose the shade of this concealer as it comes in the common ones such as beige or cappuccino but also in more specific ones like yellow or porcelain. All these options are created with high quality ingredients and they are very efficient and easy to use. Your face will look natural and beautiful as soon as you put this concealer over the affected areas and you will feel a lot more confident in yourself. And even if you can use this concealer regardless to the skin type that you have, it is perfect for dry and sensitive skin as it contains no comedogenic formula. Everyone knows the brand Maybelline and buyers rely on its quality a lot because it comes with a great tradition. Which is why this smooth foundation that can be successfully used as a concealer for those of you who have dry skin, might be just the right product for you. This concealer also comes with an SPF of 18 which protects your skin as well. As soon as you are done applying it, you will notice that your face will gain its natural aspect and shine without looking fake or covered by this concealer. Its texture is created to blend in with other makeup products that you might be using and it gets easily absorbed into your skin. You can wear this every day for the entire time of the day without worrying about side effects that you don’t want on your skin. And considering the tradition of this brand, you will be able to trust this product for the long run. If you have a dry skin and even a sensitive skin, the type of products you use on it should be more moisturising than others in order to satisfy all your needs. Benefit Fake Up Concealer is a product that understands what a dry skin needs and provides all the necessary ingredients to shine of natural health. This is a very hydrating concealer that feels nice when it is applied on the skin and makes sure your dark circles disappear. When your makeup is done, you will be pleased to see that there’s no flaws that are visible on your face and you finally achieved the level of perfection that you were going for. And half o the job is done by this concealer. The main ingredients of this product are vitamin E and apple seeds extract which offers your skin the right nutrients to look healthy and rested. Revlon is another very well known company that produces high quality makeup products and this concealer is definitely one of them, it comes in not less than 26 different shades so you can count on the fact that you will find just 1the right one for your skin tone. It is also made for normal and dry skin and offers an intense hydrating and moisturising effect while wearing it. This foundation is meant to last for up to 24 hours on your skin so there’s no need to reapply it during the day which can be very convenient. Since it hydrates your skin deeply, you will not notice any drying effect and you will be able to enjoy a smooth and healthy skin. The Revlon concealer comes with an SPF of 20 in order to protect your skin as well. But choosing the best concealer is not always the main secret that you need to consider when you want a perfect looking skin. There are certain tips and tricks that you need to be aware of in order to reach the results that you want. And we will reveal them all to you! Apply your concealer after you apply your foundation. If you are using a foundation, make sure to apply it on your clean skin before considering to add concealer. By doing so, you will actually save your concealer because you will not have to apply so much of I and you will get a much better effect. Also, if you do the mistake to apply concealer before the foundation, you might wipe most of it by adding foundation which will diminish its effects. When you apply concealer draw a triangle that has the base right under your eye and the point towards your cheek. That way you can be sure to cover your dark circles but also make the shade of your concealer blend in with your skin tone and make it look more natural. When you use concealer to cover acne, choose green concealer as a first layer and a more natural shade as a second layer. Green concealer is great for covering pimples but you also need to cover the green shade with a more natural one so you get an even pigmentation effect. This is a trick used often by make up artists and it can give impressive results when it is done properly and with the right products. Apply concealer by using your middle finger. If you don’t have a special sponge or brush to use when you apply your concealer, try using your middle finger. This finger offers the lowest pressure and the right type of coverage so it will be perfect for your skin, especially when you apply the concealer under your eye. Not to mention that this will make the entire process more comfortable for you. Stay in natural light when you apply your concealer. This might be a good advice to follow when you apply any makeup product but it is even more important if you apply a concealer. Natural light gives you the exact idea of how the shade you picked works on your skin and you don’t have to worry about the way it looks when you leave the house and find yourself in different environments. If you apply your concealer in artificial light, you might have the surprise of looking very unnatural as you step in the sunlight and no one wants that type of effect. Choosing the right concealer for dry skin is not so complicated when you know what you are looking for and what your skin needs. Which is why following the steps above can only lead you to finding the best product for you. And once you find your concealer, you will be impressed on how efficient it can be and the difference it can make for your makeup. 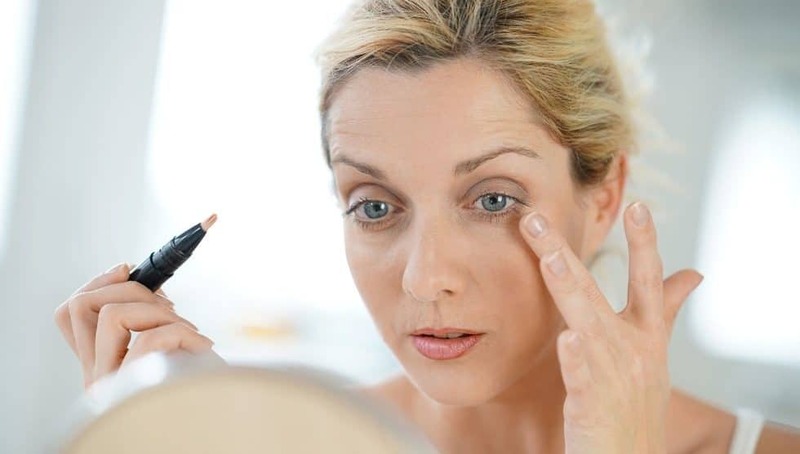 Keep in mind that you should try to pick a concealer that contains no parabens or chemicals in order to protect your skin of potential side effects. A good SPF protection is also a plus to such a makeup product and of course, the shade of it is quite important. Try to get the one that matches your skin best even if that means trying several ones along the way until you discover the ultimate concealer. Once you find it, it will become your best friend when it comes to achieving the fresh look that you always wanted.